Mr. Frugalista and I were so excited when we inherited this lovely Antique Balloon Back Chair from his Uncle's estate. Those curvy legs and carved details fit right into our decorating style. While the red velvet seat had a faint stain, otherwise the chair was in excellent condition. 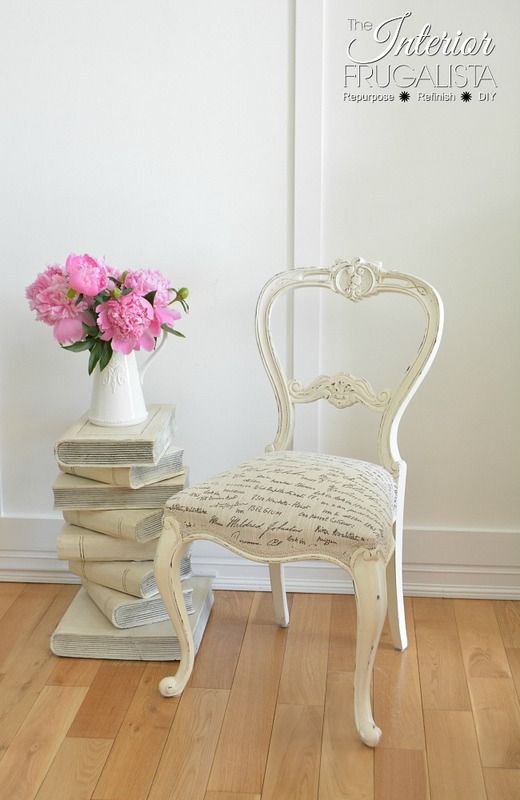 It has been a well-used chair in our home and for many years sat at a long cherry wood sofa table we used as a writing desk in our living room. Sadly after one too many gatherings and surviving two kids and a dog it started to look worn and tired, much like it's owners. This is what it looked like before. You can see the fabric is well worn and there are knicks and scratches on the wood frame. First I filled the knicks and gouges in the wood frame. 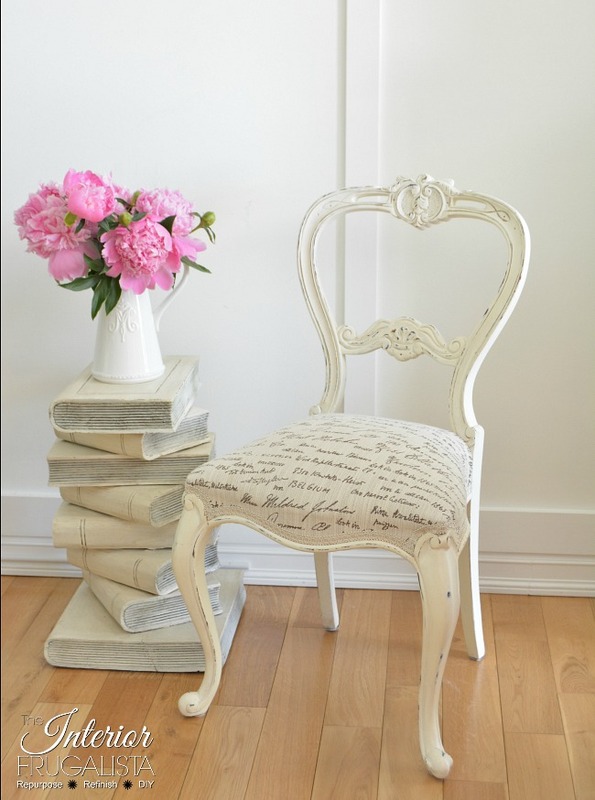 Then I gave the chair a coat of Old White Annie Sloan Chalk Paint™ and all those lovely carved details popped. When I went to start the second coat I noticed dark spots coming through the paint. Paint bleed from the tannins in the dark wood. I brushed a coat of shellac over the first coat of paint before applying the second coat and it worked like a charm. Using 220-grit sandpaper, I lightly distressed the paint along the edges and spots along the legs that would normally see wear and tear. 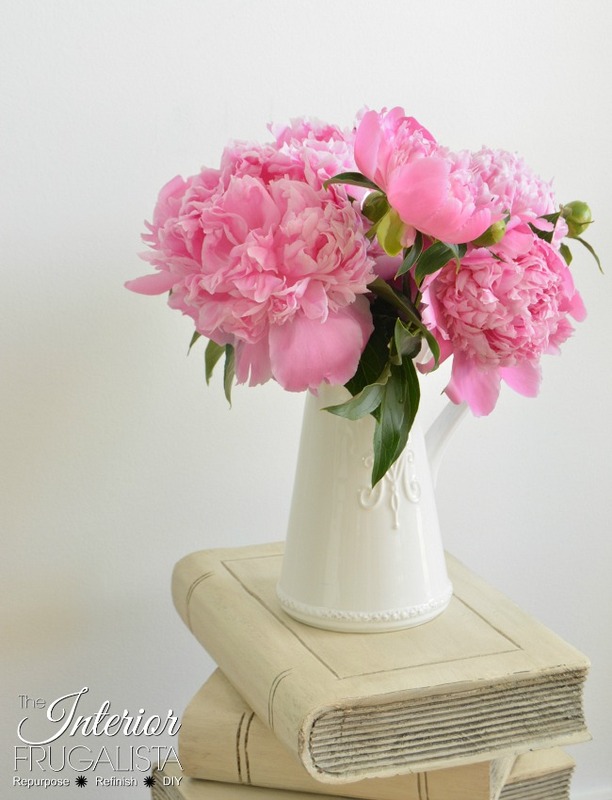 I applied a thin coat of clear wax, also by Annie Sloan Chalk Paint™ using a round wax brush. Before the wax dried and working in sections, I applied dark wax making sure to get into all the nooks and crannies and wiped away the excess with a lint free rag. A great way to get deep into the nooks and crannies of a piece with dark wax is to use a small inexpensive chip brush and cut the bristles down to 1-inch high. It is my go to brush for this purpose. Because the fabric on the seat was showing wear but not torn, the plan was to chalk paint the upholstery in the color Duck Egg Blue. As I was about to get started I noticed something didn't feel right underneath that fabric. Upon removing the fabric I noticed the first layer of cotton batting was still in good condition. So far so good. I was expecting horse hair underneath the batting but surprise - it was layers of stinky, dusty, messy straw. Once I removed the bulk of the straw I noticed the burlap base was ripped and disintegrated. Replacing straw and burlap I can handle but what was waiting underneath, I was not prepared for. Suddenly I had flashbacks of all the gatherings where this chair had been used and realized how forgiving the poor souls who had to endure hours with springs poking up their butts and never once complained or said a word. Talk about embarrassing. You can see in the photo below the twine had broken in several spots, leaving those springs standing at attention. At this point, I am very nervous. After a good clean with the shop vac, I was very thankful to discover the webbing was still in good condition and that all four springs were still tightly attached. Have I mentioned that I've never upholstered a chair before? I've taken apart old chairs for someone else to upholster. I've watched the pros do upholstery. But never have I ever attempted to fix a chair from the inside out, especially an old one. I called a coffee break and sat staring at those wonky springs while scratching my head. I remembered I bought the book The Complete Guide To Upholstery by Cherry Dobson several months back. Thank You, Cherry Dobson, you are my new best friend! I can't recommend this book enough, it is chalk full of easy to follow tutorials. One layer at a time, thanks to Cherry Dobson, we (as in Mr. Frugalista and I) managed to put the chair back together again. ...and a close-up of the fabric and upholstery gimp trim. 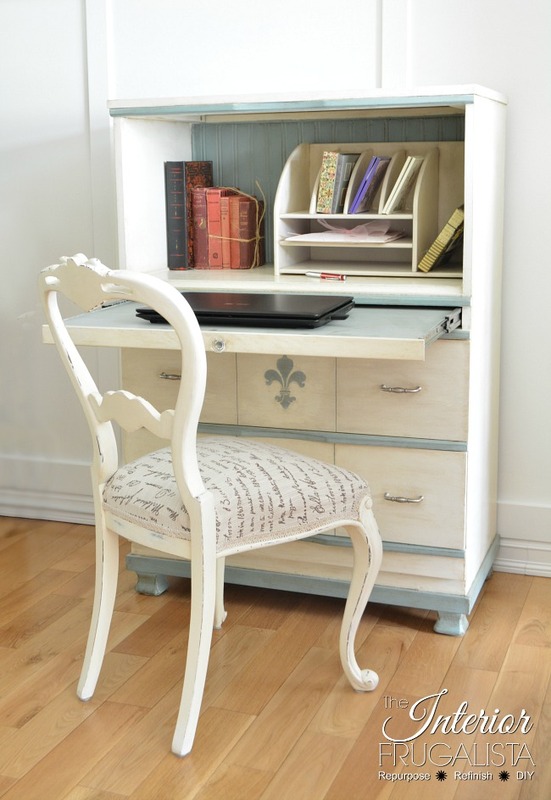 The chair is being used in our guest bedroom with the dresser we repurposed into a Faux Secretary With Pull Out Desk Top. When we inherited this antique chair we also inherited a lovely set of nesting tables. Like the chair, we used them often during gatherings but they started to show wear and tear. They ended up receiving a couple of makeovers, one of which you can find here in the post The Nests Got A Makeover. 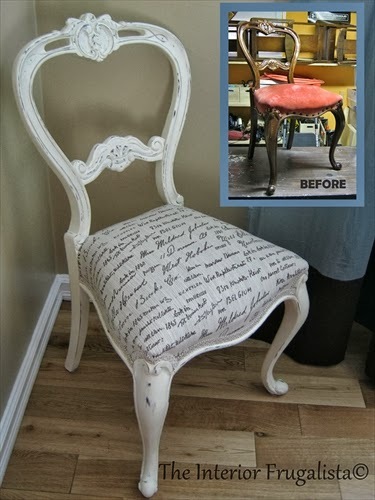 If you have a chair makeover in your future or know someone who does, please share this with a friend and/or save it on Pinterest. Like home renovations, sometimes when you think you'll just give it a fresh update, you are surprised by what awaits underneath. 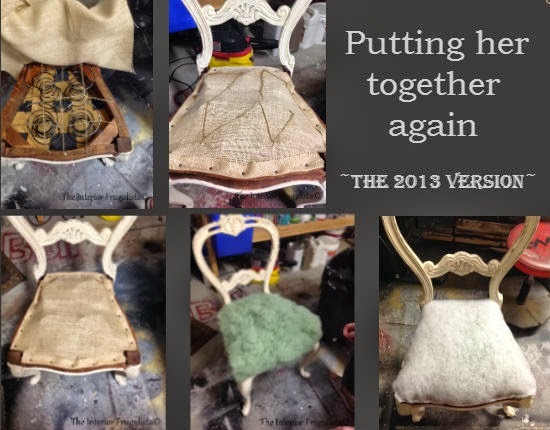 If I have any message to leave you with, it's that if I can successfully makeover a chair from the inside out, being my first attempt at upholstery, you definitely can too. With the right tools and resources at hand, IT CAN BE DONE.